Fall is right around the corner, meaning the time is now to start making your autumn getaway plans. 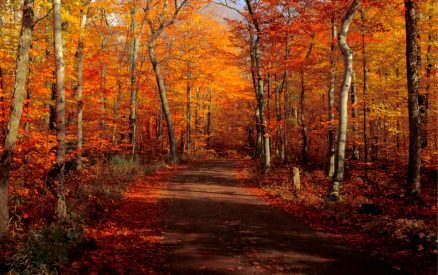 If you’re looking for a destination rich in vibrant fall colors and seasonal festivities, you’ll hardly do better than Door County, WI. The air is crisp and invigorating and the weather is bright and welcoming, making it the perfect time of year to sit outside a local cafe while enjoying the gorgeous scenery. During your fall break at The Ashbrooke, check out these lookout points for picture perfect views of the Door County fall colors. Enjoy the lovely Door County fall colors and more this autumn when you request your free copy of our Vacation Guide! This handy planning tool helps you find only the best recommendations for local entertainment, attractions, dining, and more for the ultimate fall getaway! For an all-natural and undisturbed experience, Newport State Park is the only designated wilderness park in Wisconsin. With 2,373 acres stretching along 11 miles of Lake Michigan shoreline, it is a quiet and peaceful alternative to the bustling Door County towns. The park is also a popular camping, fishing, and hunting location, but the gorgeous fall scenery attracts many visitors for sightseeing in autumn. Potawatomi State Park is a utopia for outdoor activity and provides visitors with plenty of opportunities to explore Door County’s natural beauty. During the fall, one of our favorite things to do is trek down the Ice Age National Scenic Trail and climb the 75-foot observation tower. At the top, you’ll be greeted with awe-inspiring views of Green Bay and Door County fall foliage. If you want to hit multiple outlook points, we suggest taking the Narrated Scenic Tour aboard a Door County Trolley. This journey takes you to breathtaking vistas and bluffs overlooking the islands, providing jaw-dropping views of the autumn scenery. Don’t forget to take advantage of our “First Time in Door County” package to receive two free tickets for this trolley tour! Experience Door County fall colors from a new vantage point! Fish Creek Scenic Boat Tours offers picturesque trips through Millionaire’s Row, the West Islands, Peninsula Park, and Ephraim. You can also take a romantic Sunset Live Music Cruise. Embark on a new kind of adventure that introduces you to Door County and it’s beautiful autumn landscape. Located in the heart of Door County, you’ll never be far from all the fun and everything there is to experience in this beautiful region. Our laid-back adults-only hotel creates uninterrupted bliss that is perfect for the relaxing getaway you’ve been craving. Return to your cozy and luxurious guest room after your Door County adventures or enjoy our hotel’s unique features and amenities just as an indoor swimming pool and fire table. Guests will also have the opportunity to take advantage of our exclusive specials that make a vacation in Door County even more affordable! Find your perfect room with us today or request a free Vacation Guide to find out more about us and Door County.